They spend a lot of time practicing counter techniques. In addition to the usual counter technique practices, they have a practice where all stand in front of one player and strike his/her men one by one, and the receiver tries to pull out counters all in a row. It is designed for the body to remember the moves so one can pull it out instinctively during matches. There are many patterns to this practice. Sometimes you are only allowed to aim for the degote, and other times you can go for the nukido or any other move. Sometimes the strikers will attack the men, then the kote, men again, then kote again and so forth, aiming for a specific part in a particular order. Other times the strikers will be lined up right and left, and the receiver must turn his/her body around each time to counter the move. There are even times when, after the receiver counters, the strikers strikes again without any respite. This also has variations, like aiming for the men twice or aiming for the kote and then the men. 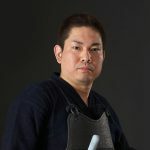 One of the characteristics of Uzumasa’s practice is that it always has the real match in mind. As the practice progresses it becomes even more oriented toward the real match. As the players face each other (aimen) they quickly exchange places and go for the hiki-men. Next, the player who does not strike the hiki-men goes for the men of the player striking the hiki-men, and the hiki-men striker must counter that. There is also a variation where the other player strikes back the kote and the first striker must counter that. 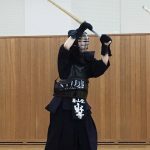 As we analyze matches between elementary school students, the time where both swords are locked take up a huge portion of the match, so the hiki techniques from the locked-sword situations become very important. When the swords are locked, they teach their players to have both feet straight or their left foot slightly forward. Because elementary students do not have so much power, so they instruct them to put more strength into their step in order to strike more powerfully. 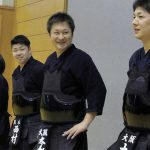 As they practice hiki-men, hiki-do and hiki-kote, they stress the importance of your body’s direction after the strike. 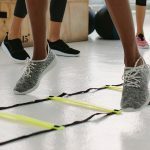 Instead of moving settling your body backwards, they settle their body in different directions depending on whether they strike the men, kote or do. Master Shimoi says that children these days are very obedient, and not many children have the strong will to say “let me do it!”. “There are too may ‘good kids’. There aren’t many kids who are naughty in a good way. They are well-rounded. And they aren’t used to being scolded. 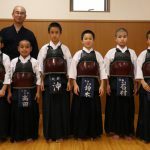 It is a challenge to train up such children, and we want to cover those things during the basic training as well.” As with the hiki-technique training, Uzumasa Boys Kendo Club does not simply pass on the basic tradition, but adds a little creative touch to it. When people do things in ways that are different from the norm, they often receive criticism. The thought of “win first, then strike” often receives the criticism that if the player does not have strength he is simply “holding the sword”. But it is not like he is simply waiting; it is just that he does not have the strength to strike, and that will change as he grows as a player. Master Shimoi also says it is important to teach children the joy of winning. This does not mean simply teaching them techniques to win, but to train them to be able to strike in a way, within the rules, so the umpire would raise the flag. As they enjoy winning, their parents get more involved too, and that shapes them for the future. “Our stance is that both child and parents do their best. 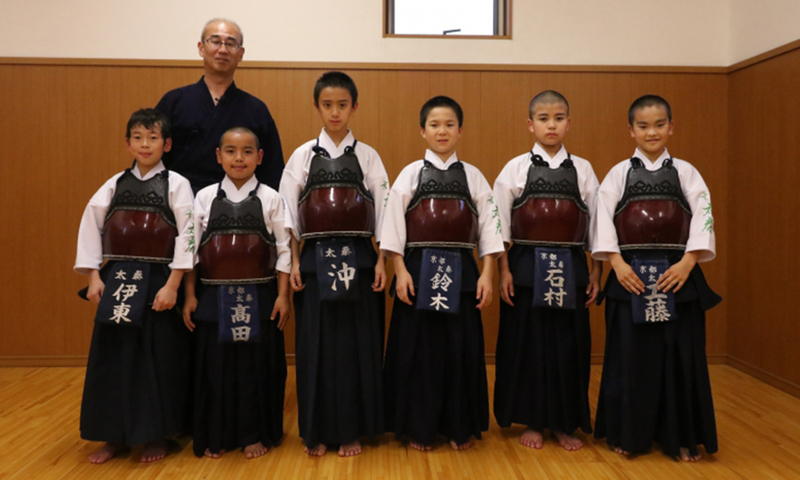 We don’s ask parents to take up kendo as well, but to support their child as best as they can. That becomes a great memory for the parents. I myself have had my son and daughter train at my dojo, and luckily my son won a prize at the All Japan Student Games and my daughter won the inter-high. I want to share the great joy of those experiences with other parents. 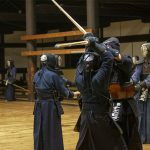 They way kendo is now, if you train well during elementary and junior high school you have a high chance of continued success in high school. We have 5 or 6 former students going to the inter-high this year, with 6 last year and 7 the year before. That adds more to the parents’ memory. Thankfully, we have many parents who support us so much as to chase us around. We need such parents to win. It is a continuous theme for us how to make parents feel that way.